Celebrating his 50th Birthday year, renowned Finnish accordionist Mika Väyrynen performed a series of World Premieres and works by Finnish Composers in the latter part of 2017. 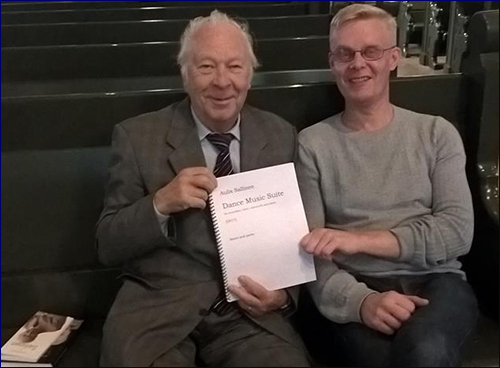 The first World Premiere was of a new work by Aulis Sallinen 'Dance Music Suite Op. 107' for accordion, violin, cello and piano. 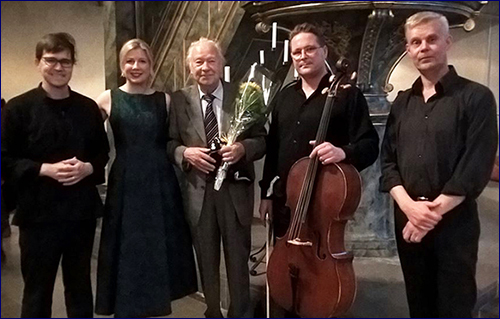 Dedicated to Mika Väyrynen, the Premiere took place at The Porvoo Church as part of the Loviisa Sibelius Festival on 8th September 2017 with the composer in attendance. 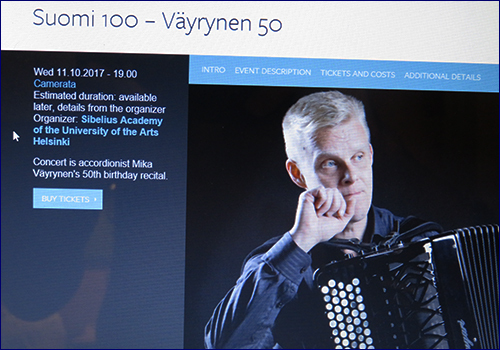 On the 11th October 2017 at Mika´s 50th birthday concert "Suomi 100 - Väyrynen 50" held at the Camerata Hall of the Helsinki Music Center, Mika performed an all Finnish program which included six World Premieres as well as launching his latest CD, the accordion works of the late Jouni Kaipainen (1956-2015). My sincerest thanks to Mika for sharing some of his thoughts and insights, as well updating us on his work with some of Finland's most outstanding composers. You have just completed what is probably one of the most magnificent Concert undertakings in accordion history. What inspired you to put together this Suomi 100 – Väyrynen 50 Concert? The reality of the situation is, that there have been changes since we have spoken the last time. These changes have not only been in my philosophy of the playing of the accordion, but also in the present situation of the accordion and the future of the accordion. Even though 50 years is not much, I have actively seen and lived quite a big part of the accordion's development from the 1970's until today. I think this is the period where the most things have happened. I've been thinking that during this developing time, we have also in a way been 'stuck' somewhere. We still play quite a lot of transcriptions. I wonder for example, why Bach and Scarlatti are still obligatory to be played in the accordion competitions of 2018. Other instrumental competitions don't require contestants to play such arrangements and my goal now is to start to show people that music which is created specifically for this instrument is also interesting. Original repertoire also comes in a variety of styles and we can easily build a complete concert of so called 'contemporary music'. These works might include polyphonic context and slow or Romantic styles. The time of experimental accordion music is over. In looking towards the future, I am going towards more original material, and in doing so, I have decided to almost stop playing transcriptions, as in my case, I no longer see it necessary. Interestingly, the response from the audience has been quite positive when playing this kind of repertoire. Finland has treated me well my entire life. It was an idea to show something that we don't always think of so much, that contemporary music is interesting! It is entertaining. It is extremely virtuosic. This Suomi 100 – Väyrynen 50 Concert was the first time in my life that I played a complete Finnish program. What made this year special, is that composers acknowledged that I had my 50th birthday. For this special occasion, they were happy to collaborate, thus making it a very productive time and a positive forerunner as to what is coming in the next 10 years of my life. I think its time that we should evolve to this direction. We are ready and the general music society is ready. Now, if I have to choose between Pictures at an Exhibition for example, or works by Kaipainen, I choose works by Kaipainen. They show more and they convince more. We needed these kinds of things in previous generations, but we simply did not have this kind of material. The Russian school was the early onset of this original music and then others like Mogens Ellegaard (1935–1995) for example, started to work with composers, and now today, while we always encouraging more, there is enough repertoire to last a lifetime. I would encourage the competitions (CIA, Castelfidardo, Klingenthal etc...) to begin reconsidering their requirements and to ask themselves if they are just staying still, or could they begin to change something? No accordionist truly knows how to play Bach as the old instrumentalists like cembalists and Baroque violists did. We pretend we know, but we really don't know. There are too many opinions, which sometimes becomes problematic in competitions, so I question why we don't change something. With just small steps with people like myself and my colleagues around the world, I think we could show that contemporary music, in addition to being interesting, is the future. In 2018 we can play a transcription of Figaro's Aria, but it doesn't show anything of the instrument. I think I provided a musical political statement in my Suomi 100 – Väyrynen 50 program. It was a nationalistic thing as I wanted to showcase that a Finnish musical miracle exists, in so far as that we have such incredible composers. To achieve this milestone, the project was a tremendous but rewarding challenge. The Goldberg Variations concert was almost easy compared to this concert! Kaipainen is undoubtably one of Finland's leading contemporary composers, having written over 100 pieces for many mediums. Can you tell us how you met him and how Kaipainen was inspired to include the accordion in his works? I met Jouni Kaipainen in the late 1990s, in a restaurant close to here in Helsinki. In his early 40s, everyone knew him and he was a celebrity at that time. I went over to say hello to him and to introduce myself. He responded by telling me that he knew who I was. I then asked him if he would ever consider writing something for me and he looked at me and said 'yes'. It was an interesting time, as within two weeks, I already had the necessary funding, and so that was the birth of the work called Vento, Op. 58 (1998). His second accordion composition (Gena, Op. 31 was written in in 1987) when Vento was written, it was probably one of the most demanding piece ever written for the accordion. It still is. 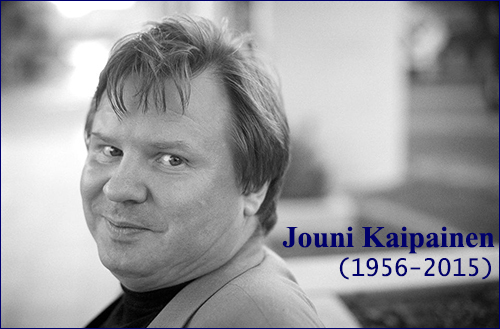 When I somehow succeeded to play it, Jouni began to hold the utmost of respect for me. After his passing, I heard that he had said, that among all the musicians he had known in his lifetime, that I was the one who learned the fastest. This was a big compliment as he worked with everybody. We became friends, not only with this collaboration between composer and artist, but we enjoyed spending our free time together once in a while. We enjoyed dining and socializing together. He was an incredibly intelligent guy and we enjoyed wonderful conversations. When he passed away on the 23rd of November 2015, we were working on a project for this concert. He was going to compose another work for me in 2016. He had discussed with me what he had proposed to do, but he didn't yet have the sketch written down. I knew him the best from the accordion world, and I knew what he liked from his compositions and how his music should be played. We had so many talks about the astetics and his compositions, so in a way I found it an honor and also a duty to do this project of recording his works and share this information. If this was lost, people would start to play the works out of the context within which he wanted. Kaipainen was extremely respectful of virtuosity. His tempo markings are incredibly fast and in my recordings, I played everything by the book. When Kaipainen wrote a metronome marking of 174, I played it at 174. To accurately interpret the pieces, I faced huge technical challenges, but I wanted to show exactly what he had in mind. Now that the CD is finally here, it is a great relief. This CD is a documentary of his accordion works and if I didn't do it, who would? The completion of the CD provides a sense of closure for me. I have now completed what I had promised to do. I told it to Kaipainen just few weeks before his passing: I will play Vento and Placido in same concert. He said to me: I am looking forward to it, and stay alive until it happens. As mentioned earlier, there was supposed to be a new work, the 3rd movement of "accordion trilogy", called "Tumultuoso". Since that last planned work was sadly never to be, I added his first piece Gena, Op. 31 (1987) in to this concert program, to at least perform his desired trilogy of solo works. For me, mentally, its has been the most important recording project of my career. I felt ready to play these works and if any of my recordings survives the test of time, I hope that it is this one. This CD of Jouni Kaipainen's works is your 25th CD's, including 15 solo ones, that you have recorded. This is quite an exceptional wealth of repertoire that you have recorded. Do you have further recording projects on the horizon? Works by: Galynin, Sallinen, Grieg, Korpijaakko, Väyrynen, Lyytikäinen, Rachmaninov, Saint-Saëns/Horowitz - arr. Väyrynen. Gena, Op. 31 (1987), Vento, Op. 58 (1998), Placido, Op. 68 (2003) and Elemental Chanting for cello and accordion, Op. 87 (2009) with Jouni Susiluoto, cello. Yes I of course hope to do more recordings in the future. However, these days, recording projects are getting more and more difficult. It's a combination of many things. For example, I think that within 10 years, the CD format will probably be gone. In the meantime, we have to start looking at alternatives such as the music DVDs which they are already doing of course and I think more and more things will be published and available online. The CD format is struggling with declining sales and the companies are facing huge challenges. When I started my recordings some 27 years ago, I was paid to make my first CDs. The next stage was that I just received the royalties from the sales, but at least I didn't have any expenses. Now, the CD labels, unless you are among the big names of the world for example, they ask you to pay for everything including the actual recording, CD manufacturer and the booklets etc.. so it makes it more and more difficult. I have been fortunate to manage to receive grants. For example, for this Kaipainen project, I received a grant from the Finnish Cultural Foundation. I have plenty of ideas in my head, but it's always a question of how to make them work, so it's always challenging, if not problematic. I would like to continue these documentary style projects, as there are a few other composers that have enough material to include in CDs. For example, I considered the possibility of recording the complete Scandinavian classical accordion repertoire such as works by Ole Schmidt etc.. or the complete works of select Russian composers. On the home front, there are composers like Paavo Korpijaakko and Aulis Sallinen that I could record more, but its always back to that same challenge of how to make it happen. These recording projects have changed and that's important for young people to know, that it's not such a simple process. I'm sure I will make some more CDs, but as the overall process gets longer, each project which used to take a year, might take a couple or more years nowadays. I could do the actual playing part of the project tomorrow, but to find the right channels to make the rest happen takes some time. Speaking of your collaborations with composers, you presented your first World Premiere of an Aulis Sallinen work in 2004. You have subsequently presented 5 other of his works, including the most recent one the 'Dance Music Suite'. Can you tell us how your collaboration with this magnificent composer evolved? My collaboration with Sallinen was quite accidental. I was booked to play with the Helsinki Philharmonic under the direction of Leif Segerstam. We were planning on presenting a Russian Concerto, however his conducting commitments for that season ended up full, so the concert was re-assigned to Okko Kamu, the winner of the inaugural Herbert von Karajan Conducting Competition in Berlin 1968. As the program was being set, Kamu said that instead of doing a Russian concerto, he preferred to conduct a work by Finnish composer Aulis Sallinen, to which I agreed of course, the Chamber music V – Barabbas Variations. We performed it at the Finlandia Hall, and at the time I didn't really hear anything further. I wasn't aware, but Sallinen's son was at the concert and after the performance, gave a recording of it to his father. This is how the connection was made. After hearing the recording, Sallinen declared that he had found in me a person to play his Concerto. Since that time, I have played it more than 40 times, all over Europe. From these performances our friendship has grown and things have progressed quite naturally. His most recent work 'Dance Music Suite, Op. 107' which I premiered on 8th September 2017 was a birthday gift from him. This is a very valuable work, as a 20 minute Chamber music composition is incredibly noteworthy from a composer of this repute. He has been very influential to me, as have other renowned individuals such as the likes of Okko Kamu. They have been like musical Godfathers to me and our collaborations have done a lot to establish my reputation when working with this caliber of great musicians. Pictured above at the Premiere, from left to right are: Paavali Jumppanen (piano), Elina Vähälä (violin), Aulis Sallinen, Jan-Erik Gustafsson (cello) and Mika Väyrynen (accordion). What role does chamber music play in your career, playing with other renowned musicians? I would like to reiterate a caution to the accordion movement. In the bigger picture, the solo concert institution is declining. When we have solo concerts in accordion festivals or during the various competitions, it doesn't reflect the big picture. I don't think of myself so much as an accordionist, as I do a musician who has the accordion as my performance medium. I spend most of my time working with the general musical society rather than the accordion society. I'm always happy to work in the accordion societies and there are great accordionists that play in the accordion circles but most of my work is in general music world. Accordionists can plays a lot of in house concerts, but its only when we go to the general music world that we see the likes of Russian pianist Grigory Sokolov and other such heroic pianists fill the major Concert Halls because of their name. Chamber Music and working with orchestras I think is key for us. It's an important way to develop the position of the accordion. I don't think these heroic name based recital institutions are a practical way forward. When we get into the Chamber Music field, it's not easy and it's important in regards to relations. It requires extraordinary qualities to do this work. It is even difficult for pianists and violinists for example, to establish such a Chamber recital series career, so you can imagine, in reality, it's even more difficult for an accordionist. We also have to keep in mind that unless you are Grigory Sokolov, they are not necessarily looking for a big name artist. If they are looking for an accordion as an instrument to fulfill a part, they are looking for an accordionist. They are not so interested in a name, so if they are performing Gubaidulina, they are more interested in the work and to just get someone to play the accordion part. I think the younger generation of accordionists are finally starting to see the importance of this sector of our work. It's of course necessary for them to have their solo concerts, but it's also necessary to develop the qualities to perform Chamber Music or play with an Orchestra as a soloist. As a friend pointed out, the accordion is just a slice out of all culture and that is how it will always be. It has its meaning and importance, but it's still a tiny sector of music culture and music history. I think we need to open our eyes a bit more, otherwise it's like riding a bike without a chain, we are doing a lot of work, but we are not moving forward. Moving is important, as well as the direction that we move in. Copyright© 2018 Accordions Worldwide. All rights reserved.